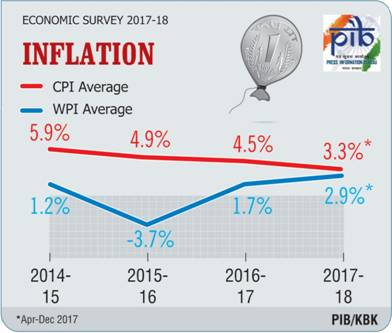 The Headline inflation has been below 4% for twelve straight months, from November, 2016 to October, 2017 and CPI food inflation averaged around one% during April-December in the current financial year, says the Survey. Inflation in the country continued to moderate during 2017-18. Consumer Price Index (CPI) based headline inflation averaged 3.3% during the period which is the lowest in the last six financial years. This has been stated in the Economic Survey 2017-18 placed in Parliament by the Union Minister for Finance and Corporate Affairs, Arun Jaitley. The decline in the inflation was broad-based across major commodity groups except Housing and Fuel & Light. The Headline inflation has been below 4% for twelve straight months, from November 2016 to October 2017 and CPI food inflation averaged around one% during April-December in the current financial year, says the Survey. However, the rise in food inflation in recent months is mainly due to factors driving prices of vegetables and fruits. In rural areas, while food was main driver of CPI inflation during 2016-17, in urban areas housing sector has contributed the most to inflation in the current financial year. If we a look at state-wise inflation during 2017-18, many states have witnessed sharp fall in CPI inflation. Inflation in 17 states was below 4%, during the period. This has been possible due to various efforts made to contain inflation at various level by the Government, says the Survey.